The FRCC is a not-for-profit company incorporated in the State of Florida. The FRCC’s mission is to promote and assure the reliability of the bulk power system in Peninsular Florida. 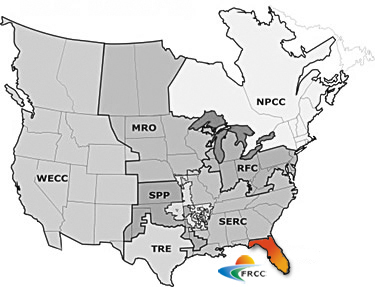 FRCC serves as a regional entity with delegated authority from the North American Electric Reliability Corporation (NERC) for the purpose of proposing and enforcing reliability standards within the FRCC Region. The area of the State of Florida that is within the FRCC Region is peninsular Florida east of the Apalachicola River. Areas west of the Apalachicola River are within the SERC Region. The entire FRCC Region is within the Eastern Interconnection and is under the direction of the FRCC Reliability Coordinator.